The Office for Human Research Studies (OHRS), Graduate School of Medicine and Faculty of Medicine, the University of Tokyo provides various kinds of information to those who wish to learn biomedical ethics with focus on research ethics, and offers a range of education/training seminars for those who aspire to be a research ethics specialist. The Research Ethics Seminar has two parts; one for first-time participants and one for renewal participants. It covers from the basics to more advanced topics, including current issues, research misconducts, conflict of interest and practical applications. OHRS offers a training session for members of research ethics committees and administrative staff all over the nation. 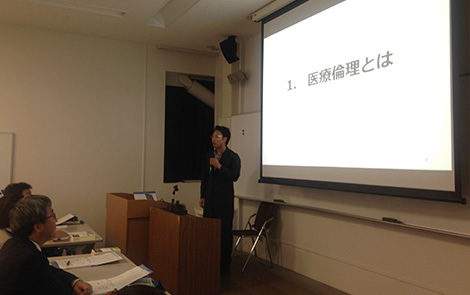 Department of Biomedical Ethics, Graduate School of Medicine and Faculty of Medicine, the University of Tokyo, provides an introductory seminar for students and practitioners who are interested in biomedical ethics. This is a good opportunity to learn the basics of biomedical ethics in a short time. Department of Biomedical Ethics conducts research and educational activities on ethical and philosophical theories as the basis of healthcare-related policy making and ethical decisions in clinical settings. Here is information on admission and much more for those who are interested in biomedical ethics and studying at graduate school. Research Ethics Specialist is a profession dedicated to protecting the health, rights and dignity of study participants and to facilitating ethically appropriate studies by researchers.